Between your last time run and first round you try to not make any changes to your car, but you cannot control the weather. Our weather stations are designed to account for that weather change and allow you to dial accurately every time. We have two ET Prediction programs that will allow you to make the most of your racing experience. Including an exclusive program that is preferred by today's top bracket racers. The purpose of our weather stations is to keep the car in the same tune up and thus have it react to weather changes the same every time. When you first get your weather station, play with your tune up until to a point where the ET Prediction is dead on. Once it is deadly accurate you make that your baseline. Then the next race you run our tune up program and change your tune up back to where the ET Prediction is perfect. Good Air vs Bad Air? The atmospheric conditions that make air quality better for racing are: lower temperature, lower humidity, and higher air pressure. Conditions that make the air worse for racing purposes are: higher temperature, higher humidity, and lower air pressure. Lower Correction Factor numbers, lower Density Altitude numbers and higher Air Density Ratio numbers all mean better air quality. 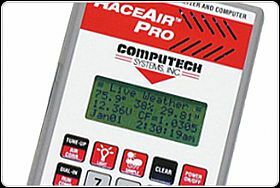 The variables that cause the Correction Factor numbers and the Density Altitude numbers to decrease (smaller numerically), as well as the Air Density Ratio numbers to increase (larger numerically), are: a lower temperature, a lower relative humidity, a higher barometric pressure (as measured with a barometer), or a lower pressure altitude (as measured with an altimeter). Typically the Correction Factor will be between .98 (better) and 1.15 (worse); the Density Altitude will be between -300 ft. (better) and 8,000 ft. (worse); the Air Density Ratio will be between 85% (worse) and 103% (better). Remember, as the Correction Factor and the Density Altitude increase (larger numerically), performance will decrease resulting in slower elapsed times. As the Correction Factor and Density Altitude decrease (smaller numerically), performance will increase causing faster elapsed times. The lower the Air Density Ratio (smaller numerically), the leaner your jetting needs to be and the higher the Air Density Ratio (larger numerically), the richer your jetting needs to be.